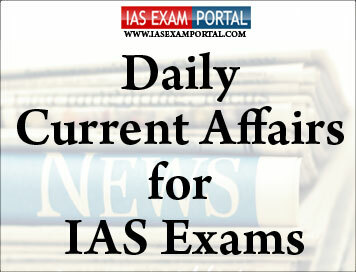 Current Affairs for IAS Exams - 25 August 2018 | IAS EXAM PORTAL - India's Largest Community for UPSC Exam Aspirants. People are dying in building collapses and fires because corruption has eaten into town planning and grant of building permits across the country, the Supreme Court said in Friday. Referring to the recent fire which engulfed Crystal Tower in Parel, Mumbai, JusticeMadan B. Lokur said thousands of buildings in Mumbai are unsafe and innocent lives are lost in the mire of corruption. “In Mumbai, people are dying. We are talking about deaths here. Only recently there was a huge fire at Kamala Mills, no lesson was learnt.. How long will this situation continue? How many lives more?” Justice Lokur said. The 16-storey Crystal Tower had shops on the ground floor, parking on the first three floors followed by three flats each on the upper floors. Four people were killed and 23, including three firemen, suffered injuries in the blaze. “We are monitoring Delhi, but what about the rest of the country?” Justice Lokur asked Additional Solicitor General A.N.S Nadkarni, for the Centre. “A person spends over Rs. 50 lakh and buys a home. Later, you tell him his home is illegal and he cannot live there. What is that person supposed to do now? The Centre cannot say it has no role and fold its hands,” Justice Lokur addressed Mr.Nadkarni. Technology has a flip-side but live-streaming of Supreme Court proceedings is a true representation of the “open courtroom” system where courts are accessible to one and all, Justice D.Y. Chandrachud said on Friday. The remark countered arguments that live-streaming of court proceedings would be misused, and verbal comments made by judges in the course of a hearing would be twisted and converted to “fake news”. To this Justice Chandrachud countered that court proceedings are live-tweeted even now and there is no authentic record of the hearing to prove a tweet wrong. “At least when the hearing is live-streamed, we will have an authentic record of what happened,” the judge responded. The CJI said that, now, verbal comments of judges are read in words. “But people may want to see you speak, look into your eyes. Why should we feel shy about that?” the CJI asked. With over 4 lakh villages, 400 districts, and 19 States/UTs declared Open Defecation Free (ODF) in rural India, the Swachh Bharat Mission today organized a National Workshop on ODF Sustainability at Udaipur in Rajasthan. Principal Secretaries-in-Charge of Sanitation, Swachh Bharat Mission Directors and other members of state teams from across the country came together for the workshop, led by the Union Ministry of Drinking Water and Sanitation. The Secretary particularly lauded the role played by Swachhagrahis in achieving and sustaining this massive behavior change in the nation. He launched the revised Swachhagrahi guidelines of the Swachh Bharat Mission, which focus on the continued role of the Swachhagrahis in not just ODF achievement but ODF sustainability as well. Several Swachhagrahis from the grassroots, representing various States, also shared their experiences at the workshop. SmtSunita Devi, a master trainer mason from Jharkhand, spoke about the State’s “Rani Mistris” who are breaking gender norms and getting into the usually male-dominated domain of working as masons for construction of toilets. She said that she has trained many of these women masons in her district and it is not only improving sanitation, but also empowering women. India’s foreign exchange reserves fell by $33.2 million to $400.84 billion in the week to August 17 mainly due to a fall in foreign currency assets, according to RBI data. In the previous week, the forex reserves had witnessed a drop of $1.82 billion to $400.88 billion. The reserves have been declining in the past few weeks as the Reserve Bank of India has been selling the U.S. dollar to contain depreciation in the rupee, which is frequently testing the 70-level against the American currency.The rupee opened on Thursday at 70.24 a dollar and closed at 69.91. Scott Morrison was on Friday sworn in as Australia’s seventh Prime Minister in 11 years, after a stunning party revolt against Malcolm Turnbull, which the new leader admitted had left the government “bruised and battered”. Former Home Affairs Minister Peter Dutton, an ex-police officer and right-winger, was the driving force behind the move to oust Mr. Turnbull after a Liberal Party backlash against his more moderate policies. But after a torrid week of political maneuvring in Canberra, it was Mr. Morrison, a Turnbull ally who served as Treasurer, who won a party vote 45-40. He was officially sworn in at a ceremony in the capital. Mr. Turnbull’s departure from politics will spark a byelection for his Sydney seat, threatening the government’s wafer-thin one-seat Parliamentary majority. In countering the Indo-Pacific strategy led by the U.S, China should forge closer ties with India, Japan and Australia, says an official media commentary. The article run on the website of China Global Television Network (CGTN) — the state-run broadcaster — argues that instead of staying aloof, China should positively intervene in shaping the Indo-Pacific agenda. In the process, “China may deconstruct some concepts put forward by the U.S. and other countries that are not in China’s interests, and replace them with new concepts that are beneficial to China by means of discourse substitution strategies,” he observes. The author spotlights the necessity of China’s firmer connect with India, Japan and Australia — the three countries that are part of the U.S.-led Indo-Pacific quad. The Chinese initiative should focus on shared interests with these countries to “weaken their motivation to join Indo-Pacific countries to contain China”. It also has an economic dimension of developing exclusive economic and trade arrangements. Besides, “sowing discord between China and other countries,” is part of Indo-Pacific diplomacy, which opens the gates for joint military exercises and arms sales. This was a 1000 MW bid for projects to be connected on ISTS (Inter State Transmission System) wherein power generated from one state (renewable resource rich state) could be transmitted to other renewable deficient states. Mytrah, Inox, Ostro, Green Infa and Adani were winners of the bid. The first auction also signified a major shift from the earlier regime of state-specific feed-in-Tariff (FiT) model to a Pan-India, market-driven mechanism. Beginning with this tender, SECI has brought out five tenders for wind power projects of cumulative capacity of 7250 MW, of which 6050 MW capacity has been awarded. Besides SECI and NTPC being central agencies, the State agencies of Tamil Nadu, Maharashtra and Gujarat have brought out bids and awarded projects based on tendering. The Southern Naval Command terminated #Operation Madad on 24 Aug 18 on successful completion of rescue and relief operations. This was the largest ever HADR operation undertaken by the SNC that lasted close to sixteen days, with a total of 16,843 persons having been rescued, of which 15670 were by boat, while 1173 had to be airlifted. Rescue camps were organised at two places, Naval Armament Depot, Aluva and the T2 Hangar, Naval Base for the displaced persons. Ladies of the Navy Wives Welfare Association also were involved whole heartedly in the relief camps in distribution of food, clothes, other essentials to the needy and making them feel at home. With flooding at CIAL causing suspension of commercial operations, SNC in liaison with DGCA, AAI and to facilitate use of INS Garuda for limited flying ops by converting one the School for Naval Airmen (SFNA) to a make shift terminal. Commercial flying commenced on 20 Aug 18 and is still continuing as on date. this operation had showcased the capability of the Indian Navy and SNC to rise to the occasion, in taking on an unprecedented disaster of this magnitude and was confident that the Command would grow from strength to strength and be ever ready to meet even bigger challenges in future. The Prime Minister, ShriNarendraModi has congratulated the team of Sawarn Singh, DattuBabanBhokanal, Om Prakash and Sukhmeet Singh on winning Gold in Rowing Men's Quadruple Sculls event at the 18th Asian Games 2018 in Jakarta - Palembang, Indonesia. Great rowing by our team. They have enhanced India’s pride by winning the Gold in the Rowing Men's Quadruple Sculls event. Congratulations to the team of Sawarn Singh, DattuBabanBhokanal, Om Prakash and Sukhmeet Singh”, the Prime Minister said.